Often times the best designs are not born of a single mind, but of a collaboration between many. The First-Calvary Baptist Church and it's members, reached out to Carpenter Costin during the summer of 2014 for landscape architectural services. At issue was a central courtyard in dire need of a redesign, in order to provide a space for reflection and prayer within a garden setting. The original courtyard required a much needed redesign. Being a larger-scale project representing the needs of many, the church requested full landscape architectural services and plan sets. After the plan sets were completed, multiple contractors (including Carpenter Costin) would be able to bid on the construction aspect of the job. This would ensure fair, unbiased, and independent design + construction services. Brendan Carey RLA from Grounded Growing Landscape Architects was selected as the designer and consultant by the church board members. He developed a series of conceptual plans focusing on circulation, drainage, and overall aesthetic. After a few weeks of intensive design work and meetings, Brendan had a set of drawings ready for landscape contractors to bid on. Carpenter Costin was quickly selected as the winning bid for the landscape construction portion of the job. Siting strong analysis and understanding of the landscape architect's plan set, along with a competitive price, the church board members turned to Carpenter Costin to turn their plans into reality. Being a courtyard in the middle of a place of worship, there were unique issues that took both acute sensitivity along with simple brute strength to solve. All materials stripped out of and brought into the courtyard, had to fit through a standard-sized door frame. Our crews crossed finished floors throughout the process and made sure to be extra careful of window walls surrounding the work zone. Working closely with the landscape architect and the onsite representative of the church, we streamlined this process as much as possible. In the end, the sum was greater than its parts. Creating this beautiful and reflective memorial garden in the heart of a church took more than one entity...it took wonderful and understanding clients, a thoughtful and talented landscape architect, and a resourceful construction team here at Carpenter Costin. An inspirational view of the new courtyard from the inside. The final look of the redesigned courtyard. *More pictures to come will show the depth of color and beauty from over 100 perennials in mid-summer. Our client in Beverly owns a beautifully renovated, craftsman bungalow on a pristine lot. There was only one glaring eyesore...a round sandpit where an above-ground pool once stood. What to do with the space? Our landscape architect, Shane Mahoney, worked with the clients through various options, designs, and layouts. The more they brainstormed, the more they were drawn right back to a circular shape. A circle form softens the strict linearity of the architecture and fence lines, while creating a strong anchor point in the corner of the yard. The next step was to figure out how to make the circle form into a usable and aesthetic part of the landscape. Inspiration came from formal European gardens of symmetry and balance. Each of the four quadrants is a raised perennial planter that doubles as an intimate seating wall. These sections of the overall circle form are divided by two perpendicular bluestone walkways that deliver you to the existing lawn perfectly on-grade. Anyone else out there thinking of replacing an above-ground pool with a Beaux Arts Garden? Request a free consultation! A master plan is a comprehensive plan of action intended to guide growth and development. You can create a master plan for professional success, for personal growth, for a community, and you can create a master plan for your home and landscape design. Your home, where you live, includes both the indoor and outdoor living space that should be complementary. You want a flow from one to the other. Your landscape should be a harmonious space from which you derive enjoyment. Landscape design is an art, as and such it uses the principles of simplicity, good scale, balance, sequence, and focalization. These principles are the guidelines in designing each outdoor feature, whether it's patio, stone walkway, a flower garden, or a shrub border. When you decide to improve your landscape, your outdoor living space, a master plan is essential. A Landscape Architect creates a master plan by working with you to understand your goals for the space and how you intend to live in it. Analyzing your goals and researching the parameters of the site helps determin the optimum solutions in advance of actual execution. Whether you implement your design in one season or break it down into phases and install over several seasons, a landscape master plan ensures continuity throughout the project. Master planning allows you a practical approach to construction sequencing and phasing, and gives you a better understanding of costs and maintenance. Our Registered Landscape Architects are available to discuss master planning. Click the button below for your free consultation. It doens't feel like Spring is around the corner but in reality now is a great time to start planning your Spring landscape. To begin, think about how you want to use your yard this year and consider areas for kids or pets, entertaining or outdoor living. If you're not sure, our landscape architects have great ideas and will help you envision your yard as a perfect place to play and relax. Bring warmth and fun to your backyard with a stone fire pit. Redefine the entrance to your home with a new walkway. Add a beautiful flowering tree for an interesting focal point. Introduce seasonal color to your property by adding flowers that bloom all season. Add outdoor living space with a new patio. Remove or transplant overgrown shrubs that detract from curb appeal. Install a stone wall to delineate a seating area. Carpenter Costin’s landscape architects will work with you to explore the possibilities of your property and turn your dreams into reality. Call now for a no obligation consultation on spring landscaping, 877/308-8733. We recently completed a beautiful bluestone patio that transformed the back of a house in Melrose. We worked closely with the clients and established a plan to remove the old and unsightly asphalt and concrete from the back area of the house and replace it with a beautiful bluestone patio. You can see that one of the challenges this yard presented was the sloped landscape. We put a lot of thought into figuring out exactly how the grading was going to work, in order to guarantee rain water would sheet-flow away from the house, and to make sure that the house, patio, driveway, and yard were all tied together properly. A creative solution to the grading problem was to extend a stone retaining wall out of the foundation of the house and top it with a thermal bluestone cap. This not only solved a grading issue, but the wall is a perfect seat, running along the side of the new patio. Emerging out of the end of the seating wall is an uncapped retaining wall that returns back into the grade and allows a perfectly scaled walkway with granite steps to guide the clients or their guests from the driveway to the patio. Unlike the smooth, newly cut granite steps within the walkway at the entrance to the patio area. The rough, recycled granite steps anchor the far corner of the space and lead one down to the sunken grass glade below. The finishing touches will come in the form of a custom deck being constructed adjacent to the patio and colorful perennials within all the planting pockets we created throughout the landscape. We can't wait to share the final results! You might think of your driveway as an after-thought to your landscape or yard work, but pictures from this project will change your mind! A beautiful driveway is the perfect touch for curb appeal, welcoming visitors, and creating a clean and polished look to your property. We just completed a beautiful 3,000 square foot driveway in Danvers, MA using a premium combination of pavers. The different shades and shapes create an interesting and beautiful look. A horseshoe section of driveway delivers you to the top parking court area and garage, which sits about 15-feet above the grade of the road. section of the drive, with a single banding at the top section to delineate the parking court area. Our Carpenter Costin masons custom built an inlaid, 6'-diameter compass rose as a center piece for the parking court area. Look at the detail! Installation of select landscape boulders, plants, and high-quality Kentucky bluegrass sod softens the hardscape edges and finishes off the overall aesthetic. We love sharing projects like this to start sparking ideas! If you're intersted in speaking with a landscape architect who can give you ideas about giving your outdoor space the perfect touch, call us at 877-308-873 or request a free consultation. Create a Destination - At Home! The fragrant hint of summer roses, the sound of the wind in the trees and the beauty of brightly colored flowers all reward our senses in the garden. After a long day of traffic jams, deadlines, difficult economic news and endless demands, a stroll through your garden can soothe the soul. In fact, researchers have found that exposure to nature can actually reduce your blood pressure, give you a sense of peace, and lift your mood. Design a tropical, comfortable and calming oasis. Imagine sipping an ice cold drink and relaxing with friends in the sun! Add a pizza oven for unmatched entertaining. Create a special place just for the kids and bring them out into the fresh air to play. A special, secluded ‘room’ in a quiet spot can be used for reading or meditation. An outdoor fireplace can be used throughout the year. After a long, cold, snowy winter, it’s time to get outside, take a deep breath and start planning how you are going to use your yard this year. As we all seek outlets for stress reduction and restoration, let our landscape architects help you transform your property into an attractive, welcoming and serene place to play and relax. Bring the warmth and fun of a campfire to your backyard with a stone fire pit. Define the entrance to your home with a new walkway. Remove or transplant overgrown shrubs that may be hiding your home. Install a fence or stone wall to delineate a property line. Carpenter Costin’s landscape architects will work with you to explore the possibilities of your property and turn your dreams into reality. Call now for a no obligation consultation on spring landscaping, 877/308-8733. 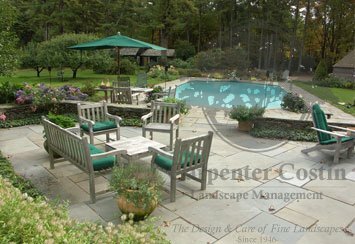 Visit our website at www.carpentercostin.net to view our landscape portfolio. Transforming a barren slope into a tranquil sitting area with water feature. It is amazing how many homeowners have areas of their property that they render useless for one reason or another. These areas are often hopelessly abandoned because they are deemed unusable, unsafe, or undesirable. Fortunately, with a little creativity and expertise from a Landscape Architect, not only can the abandoned be salvaged, but it can actually be transformed into desirable, useful landscaped areas. The property in this featured project sits with a wooded slope directly to the rear of the house, rendering the “back yard” fairly useless – that is until a Carpenter Costin Landscape Architect took a look. With some fill, minor regarding, a natural stone patio, a water feature, and some plantings, the slope in the back yard was transformed into a tranquil, and very desirable patio area. Next spring when the plants fill in, and the pachysandra ground cover matures, this area will be the complete package of hardscape, softscape, and water feature. The slope made utilizing this space a real challenge. Thinning out the trees, adding fill, and regrading helped make room for the walkway and patio. The area had scattered ground cover, but was undesirable to say the least. The new patio and two-tier water feature from the deck above. Before bringing in the fill, the slope was so extreme it made this area useless. Leveling off the slope made plenty of sitting room. As the plants fill in next spring it will make for a peaceful little landscape. A desirable, serene patio with a calming two-tier water feature. Fall is a great time for installing hardscape features, such as walkways, walls, and patios. Even though the normal fall landscape tendencies include raking leaves and assuring your trees are structurally safe to withstand the load of snow, you don’t need to wait until spring to make landscape improvements - fall is a terrific time for hardscape installation. Take advantage of a few great months for landscape improvements and install a new hardscape feature this fall that will undoubtedly add value, and a new dynamic to your property. The fall landscape construction season can last from September until December depending on how hard the ground is. Why Construct in the Fall? Constructing hardscape features in the fall has a few main benefits over installing in the spring and summer months. During the spring and summer, you want to enjoy your landscape as much as possible, and could do without interruption due to construction. If you decide to construct in the fall, it ensures your hardscape feature will be ready come spring, and you won’t miss a single cookout or lounging opportunity. If you act fast, you’ll even be able to enjoy some of the nice nights this fall on your new patio. Choosing to build in the fall also presents better conditions for growing turf and planting/transplanting trees and shrubs. You’ll have a better chance at establishing turf and plants around your new hardscape should you choose to install in the fall. Adding a patio, walkway, or wall to your property will not only increase the property’s value, but it will also serve as a functional and attractive landscape feature. Looking for a timeless, durable entertaining space? A natural stone patio may be the answer for you. Tired of the heavily trafficked areas in your lawn wearing down to bare dirt? Add a walkway or stepping stone path for extra durability and appeal. Fall is a great time to install any hardscape - from a small natural stone patio, to a large concrete block retaining wall, or a durable new front walkway. In addition, fall is also a great time for adding trees and shrubs, or transplanting existing plants to new locations. Start your fall landscape project with a free consultation with a Landscape Architect. During this consultation be sure to discuss all your wants and needs with the Landscape Architect and they’ll be able to discuss your various options, and work with you to find the hardscape solution that meets your needs, wants, and budget. Don’t wait any longer to improve your landscape. Fall is a great time for both hardscape and softscape installation! Install a stone patio around your hot tub this fall so you can enjoy the cool nights under the stars later this fall and winter!